Virtual machines and applications don’t neatly sit in one location; they are spread across users, departments and geographies. That makes them difficult to manage—especially when they are abstracted into LUNs and volumes. As you add more VMs, you add management pain. At Tintri we’re into opposites, and so naturally we believe there should be an inverse relationship between the size of your VM footprint and your storage pain. And so we return control to you with Tintri Global Center. Tintri Global Center is an intelligent control center that enables multiple Tintri VMstore systems to seamlessly function as one. It allows storage and virtualization administrators to globally manage and monitor their virtual infrastructure storage and support up to 32 VMstores. That is up to 3.2 PB of capacity, more than 100,000 VMs, and 4.5 million IOPS. 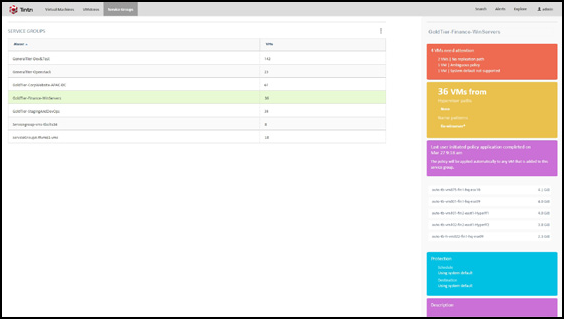 Management at scale can be done through a powerful and intuitive console or automated using REST API or PowerShell. Tintri Global Center can help storage, virtualization, and cloud administrators get a global view of their infrastructure. Its multi-tenancy capabilities allow organizations to distribute and control access based on team roles. Tintri Service Groups provide a dynamic way to automate the grouping and management of VMs with common policy management needs. Tintri VM-level storage is aware of VMware vMotion activities and can ensure that a VM does not lose its protection or replication policies and historical performance when moved between VMstores. Tintri Global Center (TGC) enables easy management of VM policies at scale while also providing granular control over a virtualized environment no matter how large it grows. Tintri Global Center Service Groups provide a dynamic way to group and manage collections of VMs with common policy management needs such as snapshots or replication schedule. Group membership can be defined in several ways, such as VM name patterns, and can include VMs from across VMstores, hypervisors, and locations. The ability to apply to apply policies at the service group level further simplifies management by ensuring that new VMs that join the group, conform to a defined policy (if desired). A change made at the Service Group level applies to all VMs in the group which makes policy management and enforcement a breeze. Different policies can also be applied at the individual VM level, even if the VM is part of a Service Group. Tintri Global Center policies are also compatible with VMware vMotion, allowing VMs to retain their policies, even when migrated to another VMstore. At full scale, Tintri Global Center can manage up to 32 VMstores and over 100K VMs, making it an essential tool for any growing virtualized environment. Tintri Global Center monitors space utilization, performance metrics, VM activity and much more, for up to 32 VMstores all from a single place. 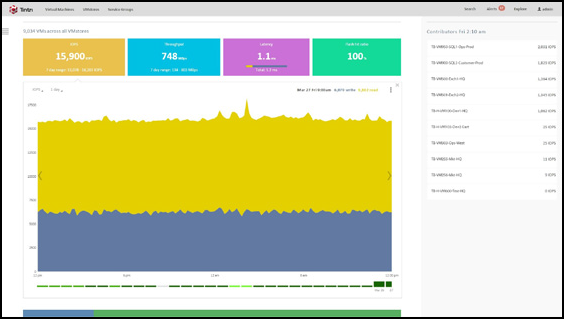 An aggregated view of your entire environment, across all VMstores, informs IT teams of available capacity and performance at any given point in time. 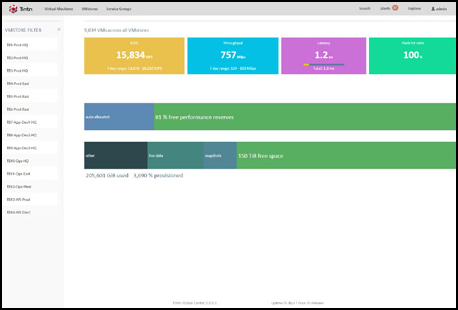 Tintri Global Center maintains historical performance of your VM storage and their VMs for up to 30 days and provides both a visualization of performance and other details in a clean and intuitive format. When combined with ReplicateVM™, Tintri Global Center provides per-VM as well as per-VMstore replication monitoring and topology views for reporting on data protection and disaster recovery service level compliance. Tintri Global Center role-based access control enables large-scale deployments through multiple users roles and access controls. Microsoft Active Directory (AD) integration provides additional flexibility by linking Tintri Global Center roles to AD groups allowing organizations to leverage their existing authentication and user management infrastructure. Tintri Global Center exposes all of its capabilities through REST-APIs and commonly used ones are also available through PowerShell. API or PowerShell calls can be directed to either TGC (for aggregate information) or directly at a VMstore. The PowerShell cmdlets can be integrated with VMware PowerCLI as well as third party automation tools. Tintri Global Center expands the goals of smart storage by enabling IT to scale and control multiple VMstore systems from a single, intuitive platform. The mix of both end-to-end insight and granular control in an intuitive interface make Tintri Global Center an ideal control center for a range of individuals from storage, VM, operations, and cloud-related teams. Tintri VMstore and Tintri Global Center together enable IT to scale virtualization and cloud environments without the challenges of a traditional scale-out storage cluster. As a result, Tintri can dramatically reduce the amount of time required to configure and oversee storage for virtualized environments, which can significantly lower IT costs and improve both performance and predictability across a virtualized infrastructure. Download the Tintri Global Center Datasheet (PDF).